What exactly is organic wine? Is it better for you? In recent years, organic wine has moved from the realms of health nuts and hippies to the mainstream, where it now represents one of the fastest-growing categories in the liquor store. But is it really that different from conventional wine? With Earth Hour coming up on March 30 and Earth Day on April 22, I’m dedicating today’s episode to organic wine, with a deep dive into what it is, its history and what the research shows about its benefits. How has the public perception of organic wine changed in recent decades? When did farmers start routinely using chemicals on their farms? What triggered the initial backlash against the use of chemicals in food and drink production? How have modern food concerns helped to build the demand for organic wines? What criteria do wines have to meet to be considered organic? Are there unified standards for organic designation? What techniques do organic vintners use instead of synthetic chemicals? What exactly is organic wine and is it better for you? That’s what we’re talking about on today’s episode. But before we get started, I’d like to give a shout out to Les Payne from California, who emailed me about episode 14, which was entitled “Bottle of the Sexes: Men versus Women on Wine.” If you missed that one, go back and have a listen as it’ll definitely provoke discussion between you and your wine-loving friends. Les Payne says: “I don’t how to characterize guy vs gal wines, however, that being said, my wife and I have very different taste buds. We can share a Cab and have 2 very different experiences. I love BIG reds and can be drinking a Barolo and she says I can barely taste, as it takes the enamel off my teeth. Love the podcast. I spend a lot of time travelling in my car and it makes the trips enjoyable. I’m so glad that you’re enjoying the podcast on your commute Les! I love to share reviews of this podcast for those of you kind enough to post them on Apple podcasts, social media or email. If you want me to mention your website or social media handle, please include that in your review, along with your name. I want to celebrate you and let others know how to connect with you online! Earth Hour is March 30 and Earth Day April 22. Naturally, you might think about pouring yourself a glass of organic wine to celebrate. But what is organic wine and how is it different from “inorganic wine”? Scientists now believe that all such substances accumulate in our bodies; and since they’ve only been used for several decades, we don’t yet know the long-term effects. Many foods are described as “organic” nowadays, but what does it actually mean applied to wine? Making wine is a two-step process: first, you grow the grapes and then you make the wine. For example, most organic wine grape growers use sulfur to control powdery mildew and so do conventional growers. The only difference is that the formulations of sulfur used by organic farmers are approved by the federal government whereas the sulfur used by conventional growers can be any sulfur. There’s still debate over whether organic grapes are allowed to be irrigated with “gray water” (partially treated wastewater). Purists also nix the use of genetically modified vines and growth hormones. In their quest to enrich the soil and keep pests at bay, many vintners inter-plant the vine rows with other crops, such as ryegrass, chicory, fescue, oats, mustard, lupins, and red clover. These cover crops control weeds and encourage bugs to feed on them rather than on the vines. Other vintners allow chickens the run of their vineyards since they both eat bugs and scratch the soil, naturally tilling it. Some build nesting boxes and perches to encourage hawks and owls to roost and hunt rodents and other pests in the vineyard. Featherstone Vineyards in Niagara uses “lamb-mowers” to reduce their environmental hoofprint: the spring lambs eat the low-hanging leaf canopy of the vines as well as the grasses growing between vineyard rows. The good news about even non-organic wine grapes is that far fewer chemicals are used on them than on other fruit. Consumers want strawberries and pears to look good on the fruit stands, so they ignore the chemicals that keep them that way even to the detriment of taste and health. This means non-organic fruit may have trace amounts of chemicals, but many winemakers purport that the process of fermentation neutralizes such residues and filtering the finished wine usually removes whatever might remain. Federal law stipulates that there can’t be any chemical residue in the finished wine, organic or not. 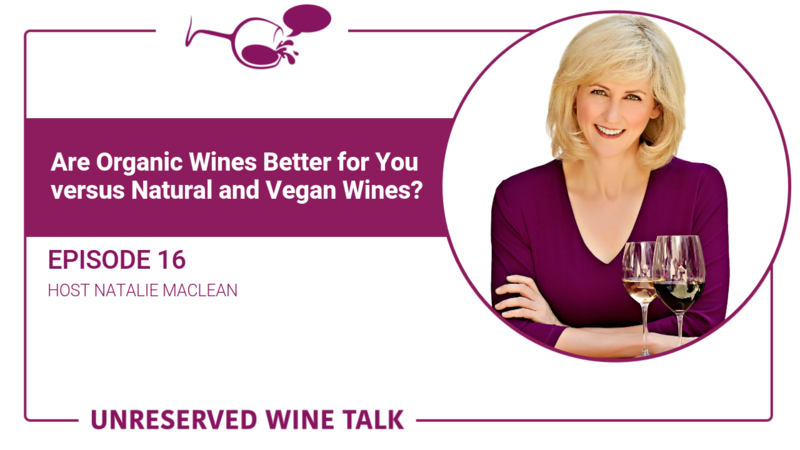 Vegan wines also don’t use clarifying substances in the trade like gelatin, blood, skim milk, and fish bladders in favor of certain types of clay like bentonite, centrifuge machines or cellulose filters. In blind taste tests, many experts perceive no difference between well-made organic and non-organic wines. That process demands careful hands-on attention to matters such as canopy management when growers prune back the leaves to create better air circulation among the grape bunches so that there’s less chance of rot. Still, in the words of Randall Grahm, owner of California’s Bonny Doon Vineyards: “Our vision must go beyond taste. I believe that wine is an expression of the earth in which the vines grow. If that earth is rich and alive, rather than a chemical wasteland, that’s got to affect the wine, even though the difference may be subtle. How about you? Do you try to buy organic wine? If so, which ones? Do you perceive any taste differences? Share that with me, please! You can tag me on Twitter or Facebook @nataliemaclean, on Instagram I’m @nataliemacleanwine . You’ll find links to my reviews of organic wines in stores now in the show notes, at nataliemaclean.com/16. Next week, we’ll chat with Thomas Bacheldor, the rockstar winemaker, who produces organic and biodynamic wines in Niagara, Oregon and Burgundy.